Shopping is without a doubt one of the major tourist trumps of Lisbon. Lisbon is, in fact, a top-notch shopping site in Portugal, putting forward plenty of opportunities not to be missed out by fashion victims and souvenir seekers alike, since, indeed, Lisbon is replete with both mainstream shopping centers and traditional shops tailored to suit the shopping tastes of a vast range of clients. The best of the fashion trade can be sampled along Avenida da Liberdade, a thoroughfare lined with first-hand international brand stores. The Baixa district is ideal for visitors who intend to explore the peaks of the traditional shopping in Lisbon, whereas the Chiado district bristles with design shops and bookstores. Design shops can also be spotted in the Santos district, and if strolling around in Bairro Alto, visitors have the opportunity to study the most diverse range of shops and stores, though there is a clear prominence of stores selling clothes and accessories. Lisbon is also home to several picturesque markets and flea markets which should definitely be searched out if not for the sake of shopping, then at least by title of a sightseeing tour. 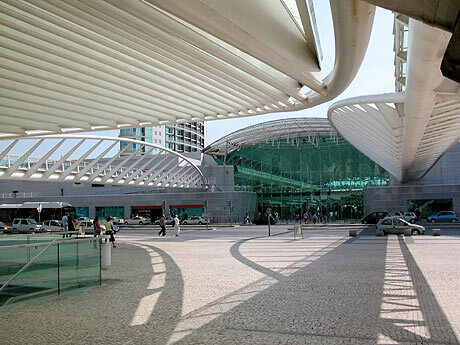 Centro Comercial Colombo offers the most exhilarating shopping experiences in Lisbon. Being home to some 400 stores, Centro Colombo is one of the largest shopping centers on the Iberian Peninsula, being an indisputable landmark of the shopping platform of Portugal. But there’s much more to do at Centro Colombo. The center features ten cinema halls, an amusement park and some 65 restaurants. Amoreiras Shopping Center is home to some 250 stores, meaning its shopping opportunities are about as rewarding as it gets. Adding the several cinemas and the restaurants available at Amoreiras, one can easily understand this shopping center is a must-visit while spending a vacation in the capital of Portugal. Armazens do Chiado is a smaller shopping center, counting about 54 stores. The range of products varies between foodstuffs and fashion products. While delighting in studying the fairly rich offer of the stores within the Armazens do Chiado, visitors can also indulge in refreshing and relaxing at one of the restaurants or at the beauty care centers located within the precincts of the center. By visiting Atrium Saldanha, tourists have the opportunity to explore a fairly miscellaneous range of first-hand brands in the field of fashion products, perfumery, jewelry, interior decorations and health and beauty care industry. There’s also a bookshop and an antiques store worth searching out. The excellence standards observed by A Vida Portuguesa in the trade of authentic Portuguese souvenirs is proven, amongst others, by the fact the company has shops throughout Portugal, in Spain and even in the United States. By visiting the Lisbon shop, tourists can admire and buy a bewilderingly miscellaneous range of products, from old books and soap to traditional foodstuffs and gift boxes. The Riberia Market is the largest and the least expensive food market in Lisbon. Visitors can easily notice the prominence of stalls proudly showcasing the fresh catch of the day, chiefly fish and seafood, which is no surprise given the local traditional cuisine is based on such prized ingredients. Other traditional specialties can also be sampled here. Flower stalls can also be spotted here. The upper floor is highly tourist oriented, since most of the businesses carried out here focus on selling souvenirs and the like. The market is located in an 1882 building which, architecturally speaking, stands out in sharp relief by its Moorish style dome. Feira da Ladra is the historical flea market of Lisbon. Local legends maintain the origins of this flea market can be spotted somewhere around the 12th century. But however old the market might be, the bottom line is it has managed to become a place of special tourist interest. Feira da Ladra surprises, first of all, by the apparent lack of organization (sellers come here and display their products on improvised stalls or even on blankets simply stretched on the sidewalk) and by the diversity of the showcased products: coin and old CD collections, stamps, clothes, books, folk art products, furniture, antiques and so on. Recently, the market has taken on the air of a tourist oriented venue.